Abstract: Experience replay lets online reinforcement learning agents remember and reuse experiences from the past. In prior work, experience transitions were uniformly sampled from a replay memory. However, this approach simply replays transitions at the same frequency that they were originally experienced, regardless of their significance. In this paper we develop a framework for prioritizing experience, so as to replay important transitions more frequently, and therefore learn more efficiently. 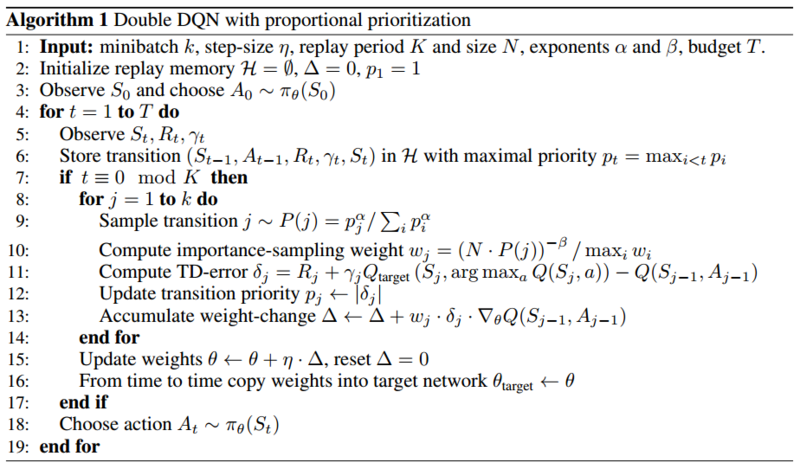 We use prioritized experience replay in Deep Q-Networks (DQN), a reinforcement learning algorithm that achieved human-level performance across many Atari games. DQN with prioritized experience replay achieves a new state-of-the-art, outperforming DQN with uniform replay on 41 out of 49 games. *p_i* > 0: priority of transition *i*; 0 <= *alpha* <= 1 determines how much prioritization is used.